Rēweti Kōhere, a Ngāti Porou Anglican clergyman, journalist and editor, often published provocative articles in various newspapers. 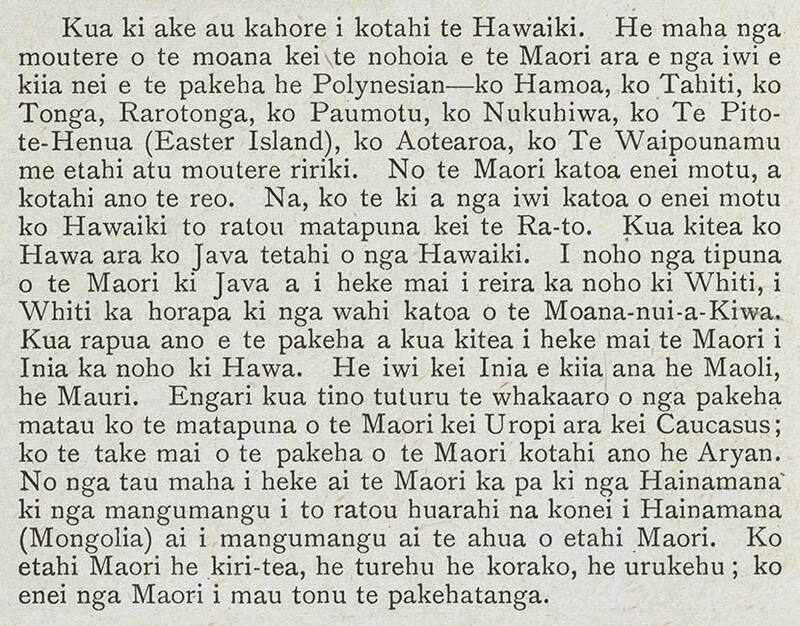 An article, ‘Kei hea Hawaiki’, published in Te Kopara in October 1920, examines the possible locations of Hawaiki and the origins of the Māori race. I have stated that there is more than one Hawaiki. There are many islands that are inhabited by native peoples, or Polynesians as the Pākehā call them – Samoa, Tahiti, Tonga, Raratonga, Paumotu, Nukuhiva, Easter Island, the North and the South Island, and many other small islands. These islands belong to the native people, and the language is the same. Their unanimous agreement is that Hawaiki is the source from which they sprang, and it lies to the west. It has been made clear that Java is one of the Hawaiki. The ancestors of the Māori settled in Java then moved to Fiji and from there they dispersed to all corners of the Pacific. Pākehā research has shown that the Māori came from India then settled Java. There are a race of people in India called Maoli or Mauri. However, Pākehā experts believe the origin of the Māori is located in Aryan origins. Through the period of the Māori migration they encountered Asian and dark-skinned races, the reason perhaps why some Māori have Asian features whilst others have dark features. Some Māori are fair-skinned and light-haired, and some have red hair; these are the Māori who retained the white features.